This stylish piece of art is the perfect way to send a unique message to someone special! The image is made up of different architectural images to display the word Birthday. Add a special message to the label over 3 lines with up to 20 characters in top right of the label and up to 2 lines of 30 characters along the front of the label. 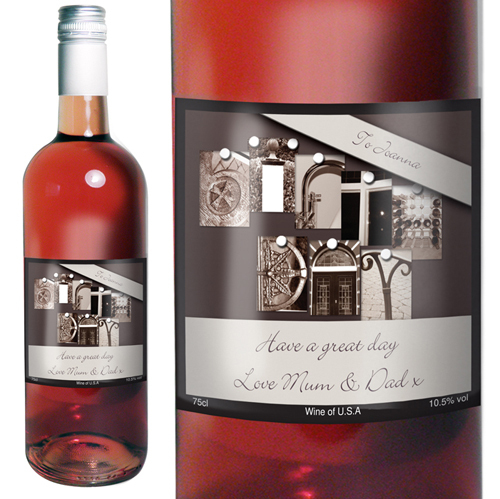 The wine itself is a lively Zinfandel Rose, rich in fruity flavours with fresh crisp finish. Personalise over 3 lines with up to 20 characters in top right of the label and up to 2 lines of 30 characters along the front of the label.